This time of year the streets become filled with cyclist eager to get get back in the saddle and ramp up their mileage. This is also that time of year our physiotherapists start to see an increase in cyclists struggling with knee pain. A common cause of knee pain in cyclists is known as patellofemoral pain syndrome, which is an irritation of the joints, formed between the femur or thigh bone and the knee cap. The cause of this irriatation can be vast, hence, we always recommend you have a knowledgable physiotherapist assess your condition to determine what the underlying cause of the problem really is. The two most common reasons for having this issue as a cyclist is due to poor bike fitting and/or muscle imbalances. Proper bike fitting is imperative to ensure our body is functioning in its most optimal positioning. The common fault we see in cyclist is attributed to the alignment of the knee as we pedal. You need to ensure the the knee doesn’t turn inward or outward as you pedal. Your leg should act like a “piston” that moves up and down without deviating to one side or the other. See the figure below. Deviation of the knee internally or externally can be caused by improper foot positioning, angulation of your float and/or muscle imbalances in the knee and hip. Often times, evaluation of the hip is missed when looking at knee pain. Most individuals don’t realize the impact the hip stabilizers have on the functionality of the knee. Many of the hip muscles are responsible for controlling and stabilizing the the thigh bone. A lack of hip strength will often, either allow the thigh bone to turn inward when pedalling or place more strain on surrounding muscles to compensate for the lack of stength, which inturn leads to repetative strain. Proper evaluation of patellofemoral pain syndrome requires that your physiotherapist not only treat the injured or affected area but also look at other definciencies above and below the affected area and correct those aswell. Happy Cycling! Previous Post Latex Allergy? Then pass on the bananas! 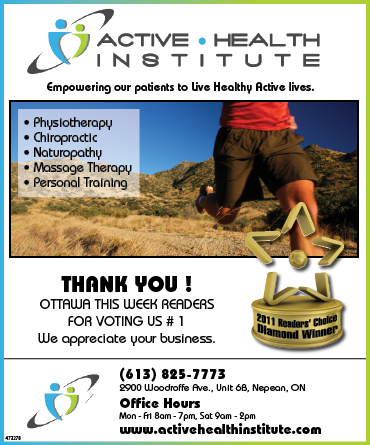 Next Post Active Health Institute Readers Choice Winners!